Items in our Outlet Store that have been recently SOLD may be shown here for reference, temporarily until they are delivered and we delete them from out database. We will not be restocking these items. 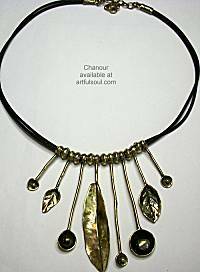 Cast bronze and gold-plated wire elements move freely across the front 3 inches of double black cord, the leafy elements extend to 3-1/4 inches long. Hook clasp in back adjusts total length 19-20 inches. Lead and nickel free components. Made in Turkey, weighs about 1-1/2 oz. 2-1/4 inches long, 3/4 inch across, surgical post about 3/8 inch below top. Leaf cast in bronze is folded outward with lustrous rough finish. Lead and nickel free. Jackie bag measures 12.5 x 4.5 on tan leather bottom, rising 6 inches tall. Golden peg legs, bag pieces are joined with the same tan leather trim. Golden frame has clasp on top. Interior lined in golden fabric, small zip pocket. 5/8 inch wide tan leather handle. The fabric is coral orange with golden mums woven into it. Extra long envelope clutch is 16 x 5.5 inches. The back and edges are in black silk with cranberry pattern of scrolling lace and peacocks. The piece of obi depicts the crane embroidered from ivory, metallic gold, red, black and gray, adorned on the flap with black bone. Closes securely with magnetic snap, opens to another piece of the obi, and interior lining in rose print. Small patch pocket. There is no chain strap or handle, this is clutch style at its most elegant! Rings, loops and curves of brightly colored cords work across the front of this necklace, nice coverage toward the back. A drape of silver metal beads across the center is balanced by a pair of flattened bell caps, which make a little tinkling noise when you move. Exotic! Amaryllis collection features bright cords of orange, pink, dark mustard and aqua work with silvertone beads. Not all colors appear in every item. REVERSIBLE. Pendants feature elements with prints under faceted glass on both sides. Larger pendant suspended below curve of thick gray cord accented in red and silvertone beads. A pair of gray cords holds this, with navy, silver and clear/red beads between, that join to smaller printed elements and dangling silver balls. Smaller pendant suspended on chain above. Swell prints have collages in navy/ivory, dark turquoise blue, marigold yellow, black, and dark red. Aphrodisia collage mixes reptilian prints in dark red, blue, marigold yellow and green. Swell & Aphrodisia collections feature necklaces that are reversible featuring both color groups with prints under glass. Swell mixes feathery patterns in deep blue and ivory with yellow and red. Aphrodisia patterns are reptilian black with deep red, yellow, green and blue. Not all colors appear in every piece. Round top has cords of green, red and silver wrapped around silver bead. Loop below has purple and ivory/red cords. A final curvy element of camel and silver dangles with silvertone beads. Begonia collection features fabric cords in camel, purple, ivory/red work around silvertone beads. Not all colors appear in every item. Sweetheart v-shaped design features the larger pointed ovals of open fabric in shimmering bronze, green, and navy/pink. Each has a smaller element at the center, gold/black or crushed gold glass. More crushed peach and pink glass, along with colorful crystals dangling at the bottom, lend the refreshing zest to the necklace. Bohemia collection features multicolor collection with olive and mustard green, fuchsia, gold, glass and metal, textural interest feeds the bohemian style. Not all colors appear in every item. Rich and deep colors within four mosaic elements, with elongated crystal fringe to finish a graceful overall design. Prints under glass and larger crystals are framed in each piece by color cord and glass beads. Emerald Cove collection features deep emerald and forest greens, lightened with teal and turquoise, freshened with periwinkle and lavender, then brightened by pops of fuchsia. Not all colors appear in every item. Simple scallop design formed by crescent and half-circle shapes of mosaics that are joined along the top edge, it curves gracefully around the neck. Beaded sections alternate with those that have patterns under glass and beaded edges, tiny crystal dangles fill in narrow spaces between the elements. Galaxy Collection features this season's Black with jet with accents that balance purple-charcoal, berry pink and bit of rose red (not all colors appear in every style). Graceful sweetheart V-neck style, smaller elements join together with multiple jump rings to stay in place. Strands of beads along sides have tiny beads dropping from the bottom. Tonal prints under faceted glass are framed by glass beads. Garden Meditation collection features bright green and turquoise blues, small and chunky beads mix with tonal prints and color coordinated cords. This is a color group that flatters most skins. Not all colors appear in every item. A touch of versatility as the main necklace strand can be worn seperately from the delicate metal beaded chain, both are joined to chain in back. Main necklace has flat fabric prints joined together at the top to gracefully curve the neck, elongated prints under glass and crystals take this beyond matte texture. Golden Sunrise collection has the warm glow of golden sun that isn't bright yellow, coral orange and red, mixed patterns emphasize different colors in each piece, such as dark fuchsia, green, off-white and lavender (not all colors appear in every piece). Lovely mix of patterns in fabric, the top has glass covering it, the bottom has flat disks with metal scalloped edging. Gypsy Rose includes roses and earth, the fabric prints are subdued tones of rose red and pink, with sandy gray, taupe, vanilla, and pastel aqua. Not all colors appear in every piece. Larger statement earring that has a variety of graceful elements joined by multiple jump rings to swing easily together. At top is the larger print under glass with beaded frame, curves below that of color cord and metallic sheen beads. Another curve of prints under glass and beaded mosaics at each side, the final drop of mosaic is filled with prints, chunky beads, crushed glass for drusy effect. Fringe of glass and pearl beads dances off all edges. Ultra romantic and busy with rich details, the many parts of this design are joined by multiple jump rings to stay in place. At the center is a featured elongated oval pattern collage under glass, that supports several other tonal prints below. Clusters of beaded mosaics are edged by numerous dancing crystal beads. To the sides are sparkling ribbons and uncovered fabrics, glass pearls, coiled chain. A strand of beads, including champagne glass pearls, drapes above center. The beaded necklace joins to golden ribbon-like chain toward the back. Nice color coverage across the neck with bold falt fabric prints at center and sides that have metal 3-petal charms on them. More fabric drips as a fringe with metal scalloped edges. Below the larger elements are metal flat caps under which mother-of-pearl disks are mounted. There are also threaded tassels, flexible wrapped cord at each end. Mariachi (Hip) Collections features multicolor of cranberry red, fuchsia, cayenne orange, cobalt, green and many other accent colors, flat fabric prints are bold 2-color graphics. Not all colors appear in every item. A little more linear in style as each element is fairly wide, joined together by dual jump rings for swinging movement. Several of the elements have patterns under faceted glass at the center, glass beads surround and dance off the edges. Menagerie (Classic) collection features lightly bright garden colors of rose pink, grass green, sunny yellow, turquoise, blue, and orange (not all colors appear in every piece). This design will stay in the lovely sweetheart shape at the front of the neck, as the shapely elements are joined with multiple jump rings. Larger pieces are prints under faceted glass with beaded frames, the entire lower edge drips with glass beads and crystals. Sayulita (Classic) Collection features bright multicolor in a sophisticated range of blue, purple, coppery orange, dark red, pink, green and softer pastel accents. The colors come from glass beads and simpler 2- or 3-color print fabrics. Not all colors appear in every item. Sunny yellow prints at top under glass, a lettuce green below, then a circle of silver studded metal, holds the final collage of leafy green and berry prints. Seaside & Twilight collections feature necklaces that are reversible featuring both color groups with prints under glass. Seaside in fern greens, berry and lemon yellow. Twilight in the same berry with pink and brighter yellows. Not all colors appear in every item. REVERSIBLE. Pendants are covered front and back with faceted glass with different prints, suspended from silvertone chain. Larger pendant has a pair of gray cords above the longer chain, joined together with moss green and red beads. Slender pendant above also has mossy crystal and suspended from gray cord. Chains have aqua and silvertone charm accents. Seaside prints are collaged with leafy green and berry red, marigold yellow and black. Dramatic and larger earring with floral prints under glass, joined to a luminous fuchsia bead and emerald green crystal that are framed in small glass beads. Interesting mix of shapes in the beaded glass and crystal fringe. Soul Vibes collection features vibrant fuchsia, bright rose and berry pinks, soothing lavender and gray, refreshing light olive green in prints under glass and beaded mosaics. Not all colors appear in every item. Busy variety of shapely elements are joined by multiple jump rings to form this dramatic necklace. There are rounds and ovals with prints, curved sections of glass eads and color cords, a strong of bugle beads draped along the top, and sparkling crystals dancing along the lower edge. A delicate chain with single crystal bead fills in above. Long necklace with fabulous feature pendant that is suspended from a ribbon-like metal chain and strand of beads/metal disks. The pendant is made of 3 elements joined into one, filled with rich beaded mosaics. At center is a fabric collage under glass that mimics a stone geode, surrounded by sparkling and matte glass pieces. There are sections of crushed glass that mimic drusy, metallic fabric, cord and chain.